Everton midfielder Ryan Ledson says he is enjoying his time on loan at League Two side Cambridge United. 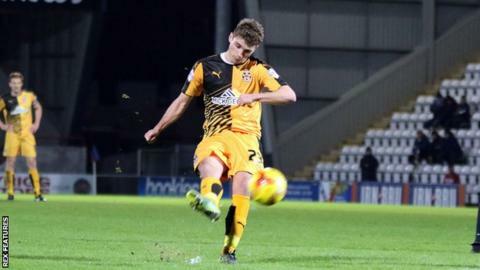 The 18-year-old has made 22 appearances for the 12th-placed U's since joining in November. "I'm only young, I've got no fear," Ledson told BBC Radio Cambridgeshire. "I just want to play as much football as I can. "Twenty-odd games in League Two is brilliant for me at such a young age. I feel like I'm improving week by week." Ledson has been with Everton's academy since the age of five, and in 2014 captained England's Under-17 side to European Championship glory in Malta. He will remain with Cambridge until the end of the season, with the U's five points off the play-off positions, and says he is relishing playing under manager Shaun Derry. "He [Derry] is a great manager and he's going to have a great career in management," said Ledson, who has appeared for Everton in the Europa League. "He's very approachable, which some managers aren't these days. "I know he was a tough-tackling midfielder and hopefully that's what I'm like. If I can have half the career he's had I'll be doing well. "We're five points off the play-offs and no one's talking about us yet, which is nice. I think it is on the cards still. We could go on a late run in these last six games."